Arriving from a relegation-battling side for a hefty £45m fee will immediately put pressure on anyone, and that was no different when Gylfi Sigurdsson arrived at Everton from struggling Swansea. Having helped the Swans narrowly avoid relegation to the Championship with nine goals and 13 assists, all eyes were on the Icelandic international in the hope that he would replicate those numbers in the blue of Everton – some may have even demanded that he do better, what with the added quality around him. However, everyone’s human, and the former Tottenham man flopped, as did the Toffees. Sigurdsson played under three managers in his debut season at Goodison Park; Ronald Koeman, David Unsworth and Sam Allardyce, managing to muster up just four goals and three assists. This campaign, in stark contrast, the 29-year-old has wrestled that weighty price-tag from his shoulders and shown the blue half of Merseyside what he is all about. Sigurdsson has netted 12 goals already this season, a new seasonal best for him personally – his tally of 11 from the 2015/16 campaign was his highest before the current term. In the 2-0 win over Chelsea, the Toffees’ first against a ‘Top Six’ side since they beat Manchester City two seasons ago, Sigurdsson was excellent. The No.10 managed to find the back of the net, albeit luckily after Kepa Arrizabalaga saved his initial spot kick, but aside from his goal he was instrumental in getting the three points. 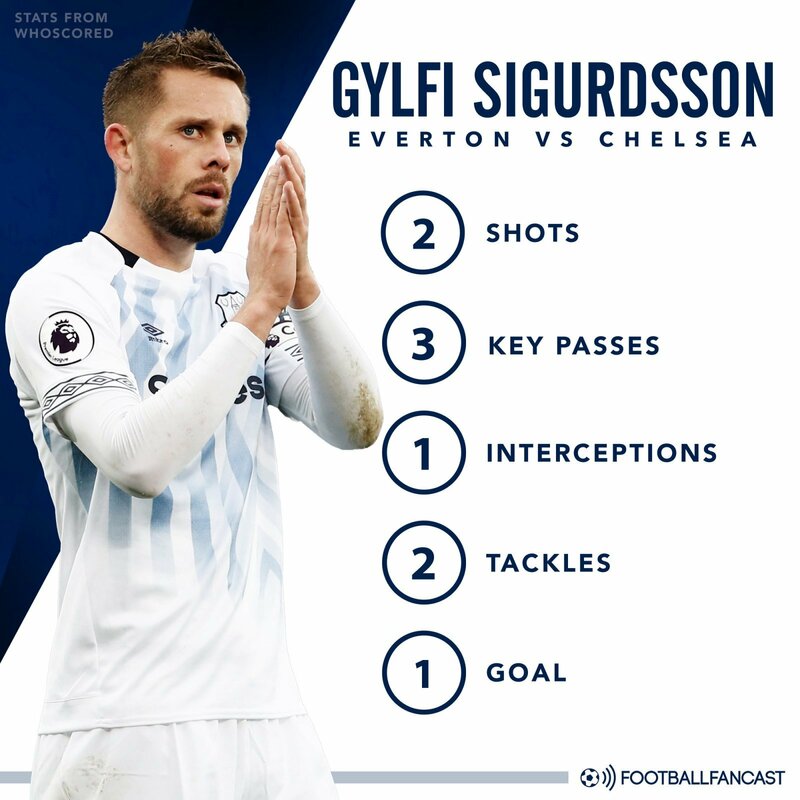 Sigurdsson also made three key passes, but showed the industrial side to his game with an interception and two tackles against the Blues to contribute to the hard-earned clean sheet. He appears to be playing with added calmness and levelheadedness after a maiden season full of all sorts of chaos, and is reaping the benefits of being amongst the first names on Marco Silva’s teamsheet.